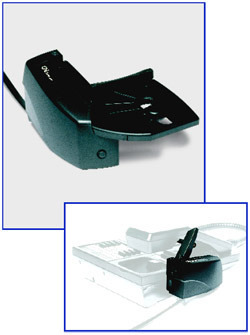 The GN 1000 Remote Handset Lifter is the perfect accessory for your GN Netcom wireless headset system. With the GN 1000, you can answer and end calls, from wherever your wireless headset takes you. It's easy to install, and its one-button operation means ease of use. Most handset lifters respond to sounds within a certain frequency range. If they're not perfectly adjusted, you can miss calls or be signaled when there isn't a call. But the GN 1000 RHL senses the magnetic field the speaker generates when your phone rings, which means it's virtually foolproof. So you never miss a call. The GN 1000 RHL's design is based on a comprehensive study of telephone measurement specifications, so it works with over 90% of all business telephones. Unless your phone has a truly unusual design, it will work with yours. And since the GN 1000 RHL has been tested to lift and lower the heaviest handsets 100,000 times, you know it will keep working. For a good long time.